We have all heard of the various famous Greek mathematicians such as Pythagoras (Pythagorean Theorem), Euclid (Euclidean Geometry) or Archimedes who are giants in their field, but who has heard of the name Al-Khwarizmi, the master mathematician from the Muslim world? Muḥammad ibn Mūsā al-Khwārizmī was born in Central Asia, Khorasan province in 780 CE, just a little over 100 years after the birth of the new Islamic Civilization. Al-Khwarizmi showed early on that he had considerable talents and usually was the most intelligent person in the room. As a result, most of his work was conducted in isolation. In the 9th Al-Khwarizmi was summoned to Baghdad by the Caliph Al-Mansur to work in the House of Wisdom. For the first time in his life is surrounded by giants, people who would be considered his intellectual equals and they pushed him and stretch his mental capacity. Muslim thinkers at the House of Wisdom during Khwarizmi’s time were busy translating everything they could get their hands on from the Greeks, Persians and Indians. By the time Al-Kwarizmi is born, much of the ancient work had been translated or was being translated. The knowledge gleaned from these texts had a profound influence on Muslims thinkers in general but on Al-Khawrizmi in particular. Al-Khwarizmi’s first gift to the Caliph was the creation of the Arabic numeral system. Prior to Al-Khwarizmi, numbers were written out in words for example 1269 would be written One Thousand Two Hundred Sixty Nine. This system worked for the level of math practiced up until that point but in order to develop more advanced topics a different system was needed. Al-Khwarizmi read many Hindu texts. He was influenced by Hindu mathematician who had already developed a numeral system one through nine and they had introduced the concept of zero. But it was Al-Khwarizmi who recognized the zero as a number and included it in the Hindu system to create the Arabic numeral system. 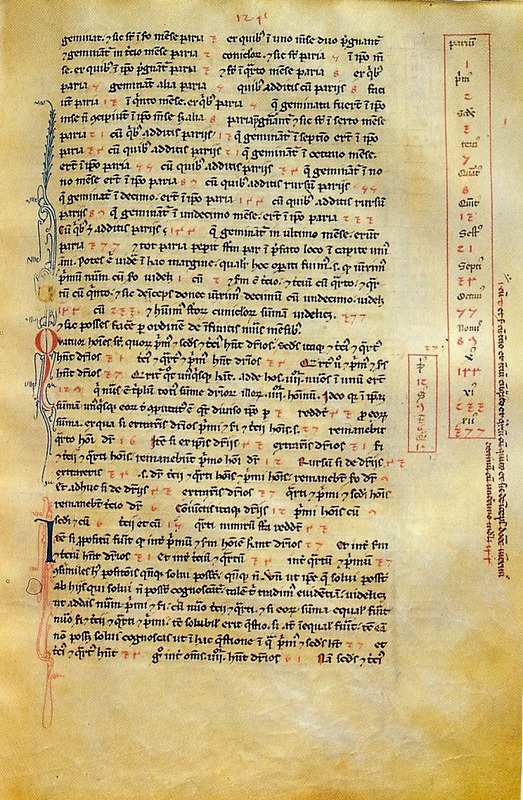 Introducing the Hindu numeral system and placing the zero at the center of his mathematical universe was a revolutionary concept that allowed for more abstract and complex computation that was not possible previously. This by itself would have placed Al-Khwarizmi in the pantheon of mathematicians, but he had another major contribution to make. Arabic Numerals (In the margins on the right) . This book introduced the Arabic numeral system to Europe. Prior to the Greeks, mathematics involved trial and error to establish the “rule of thumb”. Once the rule was established, everyone would use it without understanding why. With the arrival of the Greek mathematicians, a level of sophistication was added that did not exist previously. They used logic to derive their conclusions and mathematical rigor to prove them. The mathematics practiced by the Greeks was physical and used to solve real world practical problems such as the distance around the amphitheater or the volume of liquid in a container. The Greeks called this “geometria” or geometry which means “measurement of the Earth”. The advancements made with the arrival of the Greeks were a major jump in the field of mathematics and they were held in high esteem, past and present, for their work. When Al-Khawizimi introduced Algebra (Al-Jabr), it was a revolutionary move away from the Greek concept which was essentially geometry. It was no different than when the Greeks introduced logic into their concept of mathematics. Algebra added a level of abstraction that did not exist before. Geometry is a physical problem such as “how much water is in the container” but algebra is abstract; “if a person invests $100 in the stock market today and the investments grows at 7% over 10 years how much would the investment be worth in 10 years?” Al-Khwarizmi created a whole new field that was much broader in scope and he provided generic rules which would allow the concept to develop further. The introduction of Algebra allowed future Muslim mathematicians to turn their intellect to solving equations just for the sake of solving equations, even though they had no physically application (at least the time) such as where does a line intersect a parabola? This is what we would call today pure mathematics. This is a line of study that did not exist before Al-Khwarizmi or it was limited in scope. It is these abstract ideas that allow engineers today to build skyscrapers, mile long bridges and security encryption equations. Al-Khwarizmi book on Algebra, The Compendious Book on Calculation by Completion and Balancing (Al-Kitāb al-mukhtaṣar fī ḥisāb al-jabr wa-l-muqābala) and on numerals, Al-Khwarizmi on the Hindu Art of Reckoning were not introduced to Europe until the 12th century. His books became the core university mathematics and astronomy textbooks in Europe and the Muslim world well into the 16th century. The name “Algebra” was taken from the title of his book al-jabr. The term “Algorithm” was taken from his name which is Latin for Al-Khwarizmi (or Algoritmi). Europeans would honor and dignify all of their calculations with the foot note “dixit Algoritmi” or “so says Al-Khwarizmi” meaning they have based their calculations on faith based on the teachings of the Persian master. Al-Khwarizmi is a giant in the field of mathematics. He absorbed the knowledge of the ancient masters from Greece, Persia and India; He added his own original research and elevated the entire field to a new plane of existence. We owe Muḥammad ibn Mūsā al-Khwārizmī a debt of gratitude. Note 1: In 1976, In recognition of the accomplishments of Muḥammad ibn Mūsā al-Khwārizmī, the Working Group for Planetary System Nomenclature (IAU/WGPSN) named moon crater 7.0N, 107.0E Al-Khwarizmi in his honor. 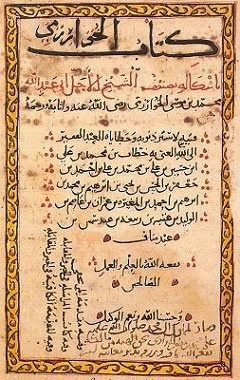 Note 2: There is a debate among scholars whether Al-Khwarizmi invented Algebra or Diophantus (in Arithmetica) several centuries earlier, but all agree that Al-Khwarizmi work is distinct and it was he who established it as a separate field of study from geometry and created the rules that govern it. Thinkers and Artists. Washington D.C.: National Geographic Society 2007. A really interesting post! Reading makes you learn such amazing and new facts! Though I hold no interest for math, it's even my weakest subject, this was a greast post to read! !